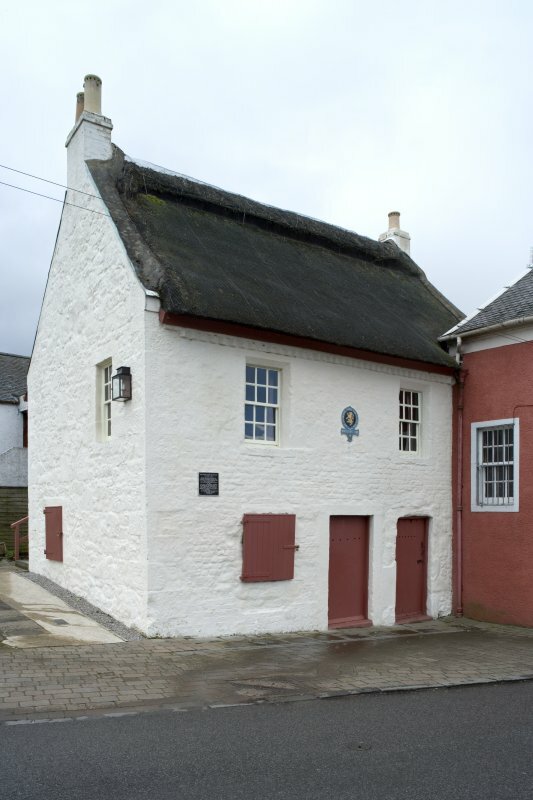 (NS 4310 2717) Bachelors' Club, Tarbolton: a 17th century thatched cottage of two storeys where Robert Burns and his friends formed their Bachelors' Club in 1780. It was renovated and re-thatched in 1971. As described and open to the public. Visited by OS (JRL) 17 November 1980. Owners: National Trust for Scotland. Non-Guardian Sites Plan Collection, DC28796, 1938. Like Souter Johnnie's House (no. 20), the Batchelors' Club owes its preservation to its association with Robert Bums. It was here, in the upper room, that Bums and his friends held the meetings of the Batchelors' Club in the early 1780s. The building itself is also of considerable interest, dating back about a century before the formation of the Batchelors' Club. 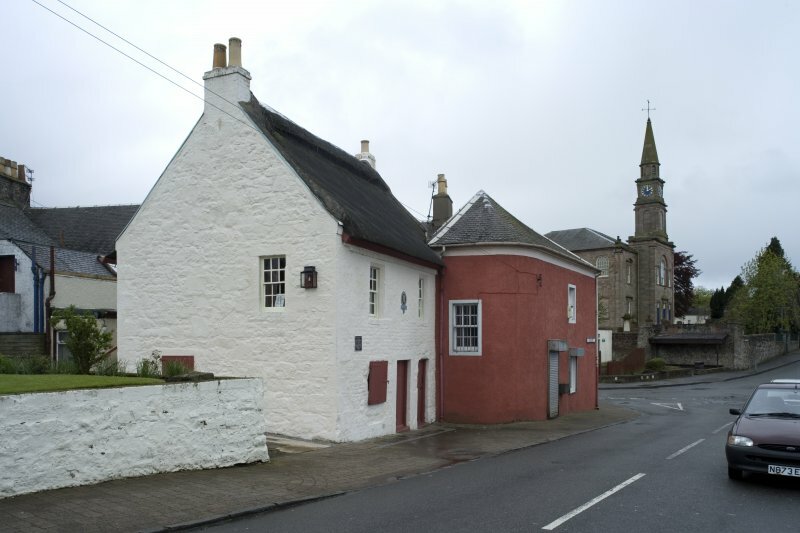 It is of two storeys with harled and whitewashed walls and a thatched roof. The lower floor is divided into two apartments, while the upper is a single large room reached by an outside stair placed at the rear of the building. The National Trust have furnished it in the style of the late 18th century, and the upper room contains a collection of Bums memorabilia. About 200m north-north-east of the Batchelors' Club, there is an unusual motte (NS 432273) with two baileys. NS 43113 27186 17th century with later alterations, two-storey house, which is now owned by the National Trust for Scotland. The notes of the listed building description for the house reads that the ‘property was acquired by the National Trust [for Scotland] in 1938 and formally opened in 1951’ and ‘was renovated and re-thatched in 1971’. The roof is thatched in reed and has a raised straw ridge. The entire roof has been netted, including across the ridge, and has been boxed in with timber underneath the eaves along the front elevation. Along the rear elevation, where the entrance to the museum is located, there is what appears to be guttering installed underneath the eaves. The thatch has deteriorated somewhat and the surface of the thatch is therefore uneven. There is also a small amount of mossy vegetation growth on the surface of the thatch, as well as some small plants growing near the skews and some loose pieces of thatch, particularly along the ridge.